Mmmmmm, Porter. Stout. Brown Ale. Bitter and Wee Heavy. Maybe on an off day, when my choice is water or a lesser brew, I might partake in a Red Ale. Anything lighter (except maybe an Oberon here or there in the summer), I leave for those who do not like beer but don’t want to stand out at a party. In short, give me a full-flavored, full-body meal in liquid form. That being said, my house ale is a smoked porter. The first beer I brewed was an English Porter, the second a Peat Smoked Porter. Being new at brewing beer, I purchased an extract kit with specialty grains from Northern Brewer. The wait was well worth it. I enjoy the bite from the peat smoke and the overall appearance and aroma. After several batches I decided to have it on tap at all times. The difference today – BIAB (Brew in a Bag). A little about the label. The rather regal-looking gent is Archduke Franz Ferdinand of the Austro-Hungarian Empire. The “Black Hand” referenced in the name belonged to a secret Serbian military society seeking to unify ethnic Serbs. 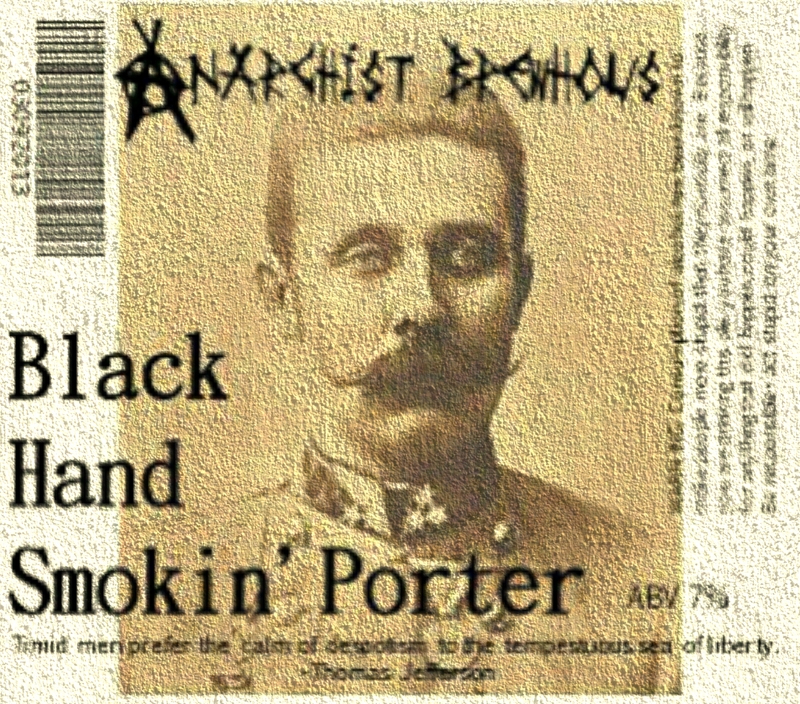 Because the malt used in this porter was smoked peat, “Smokin'” could be taken as a double entendre – Archduke Ferdinand was shot by Gavrilo Princip, a member of Young Bosnia formed by the Black Hand, with a .32 caliber handgun.